Wonderful Art Deco Map of Paris and Versailles. Paris et ses Monuments. Versailles et ses Promenades. 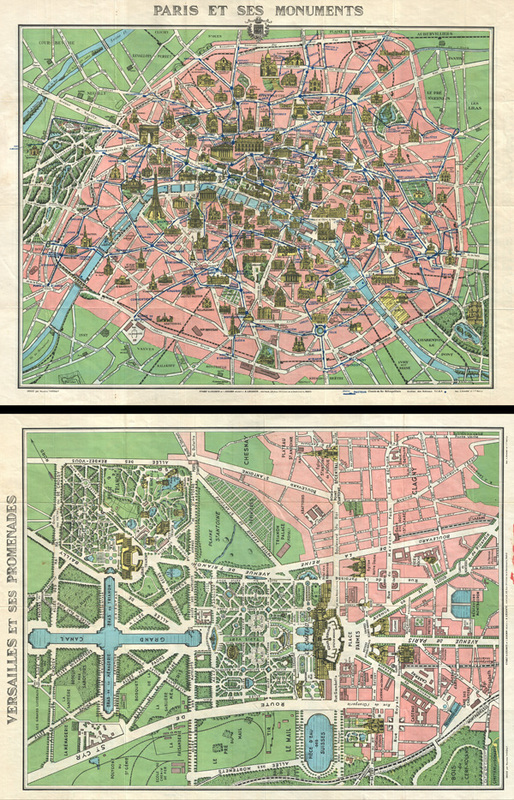 This is an extremely attractive c. 1925 tourist pocket map of Paris, France. Covers the old walled city of Paris and the immediate vicinity. Drawn in a lavish art deco style with important buildings are shown in profile, including the Eiffel Tower, the Arc de Triomphe, Sacre-Coeur, the Pantheon, and others. Shows both the train and Metro lines throughout the city. This map was issued in various editions from, roughly 1900 to 1937. Most examples, like this one, are undated but we can estimate a approximate date based upon the development of the Metro. This example is also exceptional in that it features a pan of Versailles on the verso. Engraved by L. Poulmarie and printed by Gaston Maillet. Published by A. Leconte and L. Guilmin, of 38 Rue St. Croix de la Bretonnerie, Paris. The photo above shows both the front and back of a single sheet. Leconte, A. and Guilmin L., Plan Monumental Paris Versailles, c. 1925. Very good. Original fold lines. Map of Versailles on verso. Comes with original red art deco style binder.